5.31.2013. St Louis is the perfect symbolic place to start a trip to the historic Old West. Many an adventure commenced here, including that of Lewis and Clark. We'll be following much of the Lewis and Clark trail on this trip. I always liked those guys. Ok, not always. In 1964, St. Louis celebrated its bicentennial, capped off by the construction of the Gateway Arch. I was in high school and way too sophisticated to be interested in scruffy old fur traders and missionaries, much less the abstraction of "westward expansion." However, it was interesting to observe the arch being built, when it got tall enough to be seen on my way to school. The big suspense was whether the two legs would meet at the top. I never doubted that they would. I figured the suspense was just a game ginned up by bored adults -- like the trope that East St Louis was planning to build a giant croquet ball. Hardiharhar. It took me a long time to start appreciating the guts it took to push the frontiers. We took a break from the relentless roadwork on I-70 and drove on old US 40, through eastern Indiana. A little historical understanding is always helpful in flat farmland and small towns: US 40 was among the first of the federal highways built during the 1920s. This cross-country east-west route was built on top of a number of old roads -- in the east it was the National Road, built very early in the nation's history, around 1806. As luck would have it, we drove the route on the first day of the 10th Annual Highway 40 Yard Sale, which takes place on 825 miles of road between Baltimore and St Louis. Of course, we didn't know it at the time, so we wondered why everyone had their crap out on their front lawns and if it were a permanent sort of thing. From Indianapolis on, roadwork continued to slow us down, so that we arrived in St Louis later than usual. En route, we listened to downloads of The Rachel Maddow Show, Kagro in the Morning, and the beginning of an engaging audiobook "In Defense of Food" by Michael Pollan. We rolled up to the Juniata house in time for cocktail hour. Mom made us a dinner of pork tenderloin, cole slaw and potato salad. Later Kathleen and Ellen came by and we had a great old sister talk. Now a sleepy morning. I went for a short walk and continued listening to Robert Thurman's "Liberation Upon Hearing in the Between: Living with the Tibetan Book of the Dead" -- not exactly light fare, but Thurman has a great way of making Buddhism accessible to Westerners. I'm thinking about reincarnation for a writing project, so I guess that's why I got the urge to listen to it for the third or fourth time. 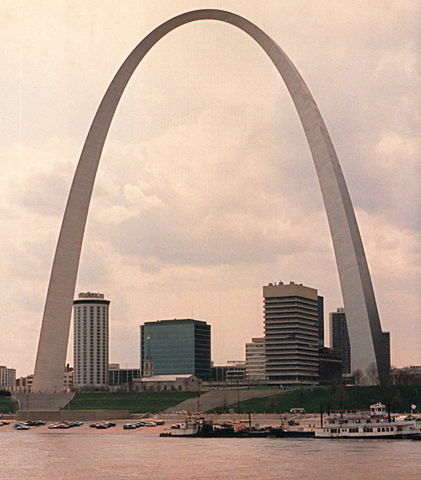 PHOTO of the Gateway Arch, St Louis MO by dwaynep2014, accessed via WikiMedia Commons 5/29/2013.